Welcome to Ripper's Body Shop, Inc. in West Sacramento, CA. Our auto body and collision shop is proud to provide auto body and collision repair for the West Sacramento and the surrounding area. We will treat your car like our own. No matter if you are from West Sacramento or outside of West Sacramento, we will gladly provide all the necessary auto body repair services. When you bring in your automobile, our well-trained estimator will greet you, and assist you with your needs Our refinish technicians are thoroughly trained in proper procedures for every kind of situation. The materials we use on customers vehicles are the very best money can buy. The colors for each vehicle are matched in house using our computerized color database. 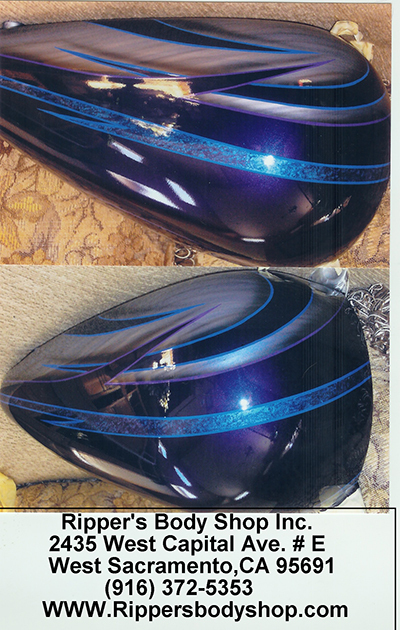 We mix and test on spray panels for color match; finally applied to the vehicle. We work for our customers and we are not a DRP shop. Our goal is to bring our customers vehicles back to pre-loss condition as quickly as possible and to exceed your expectations. For our customers, this translates into a fine auto body repair experience that has a minimal effect on your life as far as additional worry. At Ripper's Body Shop, Inc., our advanced technicians specialize in Auto Body Repair, Collision Repair, Dent Removals, Auto Paint Work and Deductible Reductions.So drop by our auto body repair shop and we will show you, why we are considered one of the best Auto Body and Collision Repair shops in West Sacramento. "Getting into an accident is hard enough to deal with, I did not want to be run around by insurance and repair companies. Ripper's Body Shop informed me of my rights as a motorist, my options with my insurance company, and gave me an estimate with a clear explanation of the repairs that were to be done. My repairs were timely and flawless, and the staff were understanding and more than helpful. I could not have asked for better service." Ripper's Body Shop, Inc., 2435 W Capitol Ave Unit E, West Sacramento, CA 95691 Phone: 916-372-5353, URL: Ripper's Body Shop, Inc.